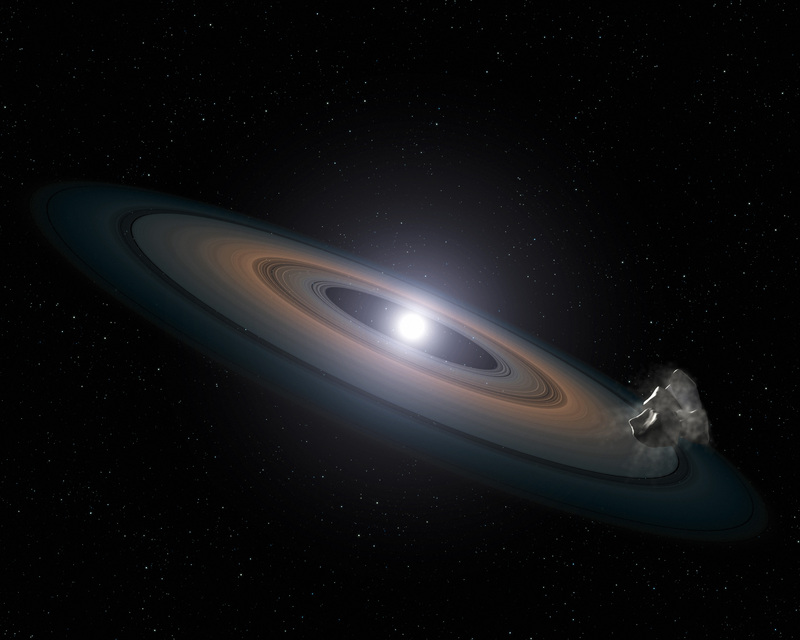 This illustration is an artist’s impression of the thin, rocky debris disc discovered around the two Hyades white dwarfs. From http://en.wikipedia.org/wiki/File:Artist%E2%80%99s_impression_of_debris_around_a_white_dwarf_star.jpg. Fun talk today from Dr. John Debes from the Space Telescope Science Institute (STScI) about white dwarfs eating planetesimals. White dwarfs are the ghostly embers of former stars — they originate when a star (that is small enough not to become a black hole instead) dies and leaves behind a dense core of carbon and oxygen, enshrouded in a thin hydrogen atmosphere. That white dwarf core then slowly cools and darkens over billions of years, basically doing nothing else. However, many white dwarfs show telltale signs in their atmospheric spectra of rocky materials. Debes, along with others, has suggested that material arises from asteroids that are perturbed by distant planets around the white dwarf. Those orbits take the asteroids so close to the white dwarf host that they are ripped apart by the star’s gravity, producing a cloud of dust and gas that then accretes onto the star. Astronomers can very accurately measure the composition of that dust, which can actually tell us something about the compositions of asteroids in distant planetary systems. So astronomers can learn about what makes up the planets in distant systems by studying the remains in these planetary graveyards.